A quick way to modernise an old office building is to refurbish the façade. Refurbishing a façade to take in the latest energy requirements and design practices not only looks great, but can drastically increase the value and appeal of a building. 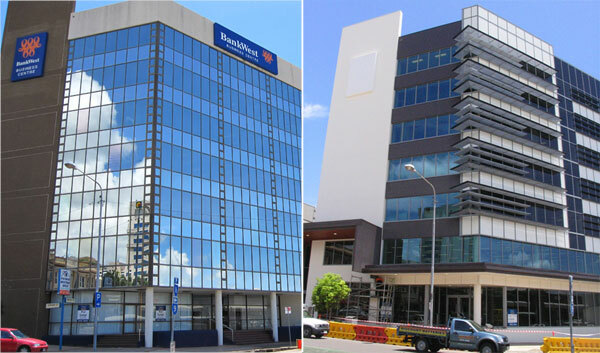 Located on Denham street in Townsville, the Bankwest building has recently undergone significant refurbishment. Originally known as Melton Place, construction on the building was finished in 1982. As part of the refurbishment, G.James were contracted to design, supply and install a new glazing façade to the existing 7 storey building. A major consideration in the removal of the existing glazing and replacement with a new glazing façade was water penetration problems with the existing stick system curtain wall. One of the prominent features of the building is a 135º south facing corner. Nettleton Tribe Architects‘ vision was to incorporate a 90º sunshade on the corner to create a striking visual feature, but due to the geometry, the horizontal sun shading system would have a projection from the glass of up to 2 metres. 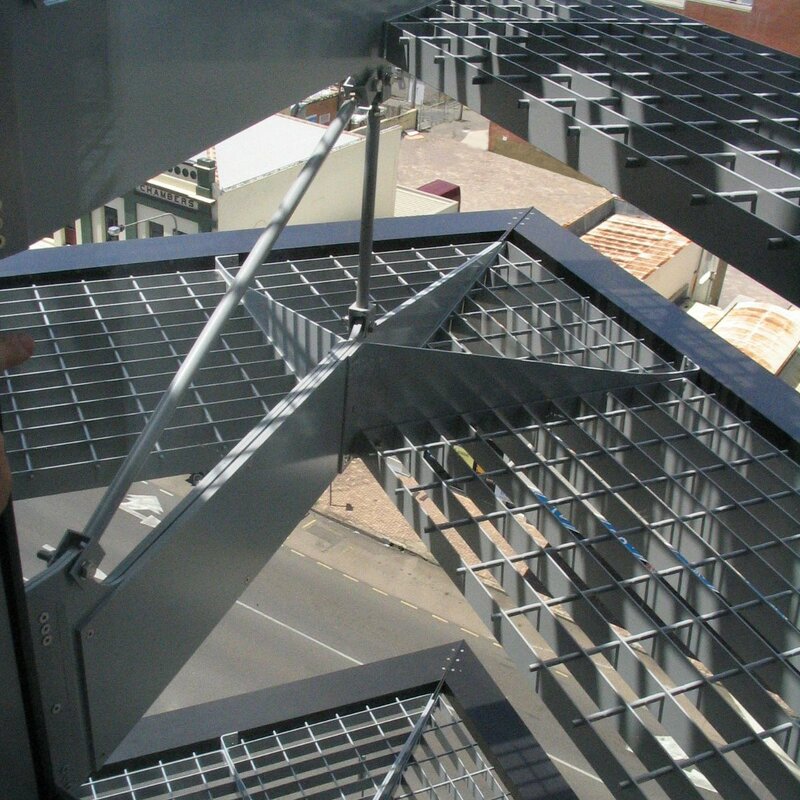 Designing the supporting structure to withstand a maintenance worker at a 2 metre cantilever from the glazing was a challenge in itself, but the location of the building in Australia’s cyclonic region brought the additional requirement for the sun shades to resist high uplift wind loads. In spite of these challenges, we were able to design a sunshade which satisfied both the aesthetic and strength requirements of this project. Due to the sensitivity of the building to previous water leaks, we engineered a solution which ensured there were no penetrations through the new façade for the support of the sun shading. The horizontal sun shade s were designed to be supported by minimalist structure fixed to the glazing framing outside the rain-screen line of the new glazing system, preventing any penetration through the façade. The tension-member truss supporting the sun shade corner was designed sympathetic to the expansion joints which occur at every floor level to ensure building movements can be accommodated for. The building was occupied during the facade replacement so there was a need to minimise disruption to the tenants. Due to the geometry and fixing method of the existing façade, we executed a top-down floor by floor demolition, and installed the new façade as we went. The finished façade not only greatly improved weather resistance, but also gave the older building a fresh and modern look. 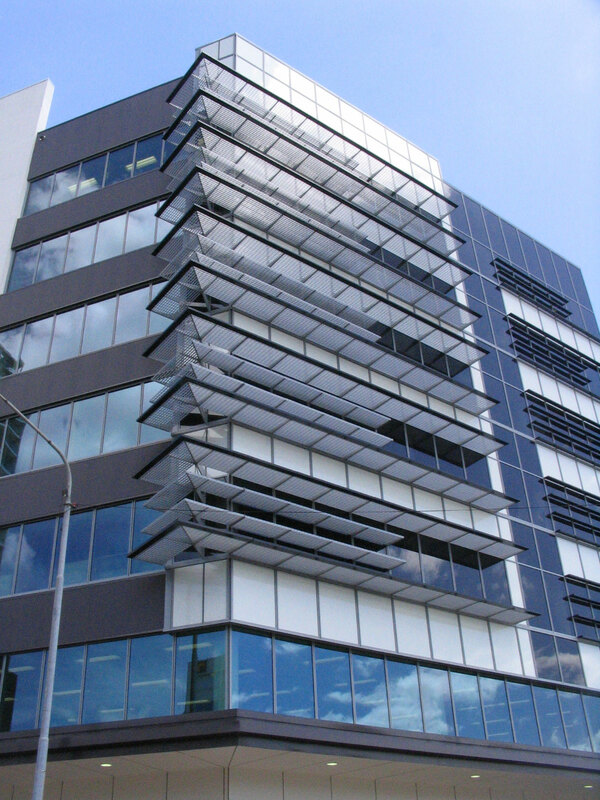 This project was a collaboration between G.James’ local Townsville branch and our Commercial Façades division. Images courtesy of Architects: Nettleton Tribe Architects. This entry was posted in Facades and tagged refurbishment, sun shades. Bookmark the permalink.